Chef Rocco learned at an early age that “there’s more to being a chef than just cooking.” Memories of sharing family meals, and growing up in a household that revolved around food, instilled in him the idea that a meal should be lingered over and savored. It’s those memories that guide him today. Chef Whalen relies on the best—the best ingredients on his plates, the best people on his staff, and the best products in his kitchen. Everything works together to create the ultimate dining experience for his customers. “Every day it’s a pressure cooker in the kitchen to be open by 5:00,” he says. Prepping ingredients, perfecting flavors, stocking the bar; the restaurant buzzes with activity long before the doors open. Chef Rocco looks for products that will make his team more efficient in those hours before service starts, and throughout the night. That’s why the first thing he reaches for is the Vitamix machine. And that’s what it’s all about for Chef Whalen—creating the very best. You can see it in the way he carefully prepares his silky smooth Truffle Cauliflower Parsnip Purée, a decadent finishing touch to any grilled steak. Whalen also carries this meticulous attention to the bar, as his unique ginger beer twist on a premium citrus margarita demonstrates. “I don’t really know a person that doesn’t like a good plate of food.” Dining at Fahrenheit is an opportunity to linger over a delicious meal. 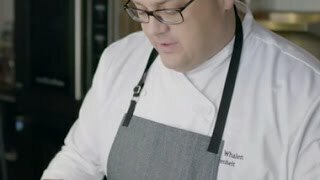 Chef Rocco Whalen has restaurants in Cleveland and Charlotte, and has been featured in Gourmet magazine, Crain’s Business Cleveland, and on the Food Network. You can connect with Rocco on Twitter, Instagram, and on his website.